Embedded safety-critical systems must not only be functionally correct but must also provide timely service. It is thus important to have rigorous analysis techniques for determining timing properties of such systems. We consider a layered design process, where timing analysis applies when the system is integrated on a target platform. More precisely, we focus on contract-based design, and ask whether a set of real-time components continues to comply to a given system specification when it is integrated on a common hardware. 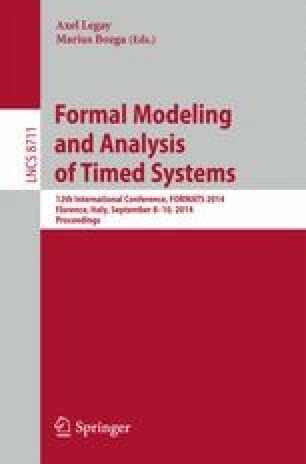 We present an approach for compositional timing analysis, and define conditions under which the system integration will preserve all the timing properties given by the system specification. Therefore, engineers can negotiate specifications of the individual components a priori, knowing that no integration issues will occur due to shared resource usage. The approach exploits ω-languages, which enables analysis techniques based on model-checking. Such an analysis is shown by a case study. This work was partly supported by the Federal Ministry for Education and Research (BMBF) under support code 01IS11035M, Automotive, Railway and Avionics Multicore Systems (ARAMiS), and by the German Research Council (DFG) as part of the Transregional Collaborative Research Center Automatic Verification and Analysis of Complex Systems (SFB/TR 14 AVACS).